Rated 5 out of 5 by monkeyrind from A return to the MCF that I loved so much! I'm so happy to have this series continue by going back to it's eerie roots!!!! Rated 5 out of 5 by aecidia6 from Fantastic Loved this game,i love the setting its creepy.The scene are beautiful and creepy.story line's great. Rated 5 out of 5 by mikesilverman from LOTS OF FUN AND NOT TOO HARD This game was fun and visually magnificent, and fairly easy to complete. Some people have said that this is a difficult game or that the puzzles are difficult but I did not find that to be the case. From 2 to 7 minutes maximum is what I spent on solving the various puzzles. I would rate the puzzles as moderately difficult. If you have already successfully finished 3 or 4 hidden-object style games, then you should not have too much trouble with this one. 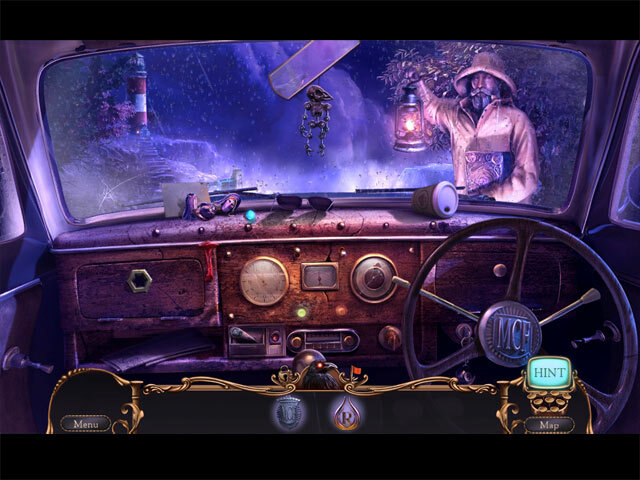 I have not played the other hidden-object games in the MCF Mystery Case files series, but you don't have to have played the previous games in order to play and enjoy this one. While there are some references to previous episodes of the MCF series Ravenhearst, it in no way impedes or detracts from the play and enjoyment of this game in a stand-alone status. The visuals are beautiful, the scenery, the rooms, and the people are rendered in exquisite detail. There is a an authentically spooky spine-tingling feeling to the game as you wander through the strange old rooms of the mansion. Just as an example, when you enter the study of the old mansion and look out the windows you can see the roiling waves of the ocean splashing up against the windows as lightning crackles overhead. The puzzles, as I mentioned, are not all that difficult but they are very entertaining. Especially the large puzzle screens that contain four or five different "micro" puzzles within them. Completing each of the micro-puzzles provides you with a key part to activate the next micro-puzzle segment. The thing about these large puzzles with the micro-puzzles in them is that the puzzle screen itself contains very good clues as to how to complete each little micro puzzle, so poke around on those screens and you will likely uncover helpful hints. While there were a couple of times I felt that I was stuck , it didn't take me long to figure out why and what to do. At various times during the game you might find yourself with some inventory items but no place left to go with them, seemingly nowhere to use them. You looked everywhere but there doesn't seem to be anything you haven't tried. Ah, but what I didn't realize at first was that there is a puzzle-box connected to the inventory screen. And at various times, when you have collected the needed inventory piece, you have to click on that puzzle box that is attached to the inventory screen and use that to advance to the next part of the game. Also, there are some puzzles that present a coded keypad, but try as you might you can not find any code to use for that keypad. Well, these few keypads have no key code to locate, you have to simply play with them on a trial and error bases to figure out which keys pressed , in which order, will light up the lights and unlock the door. Overall a very fun, very entertaining game that I highly recommend. Rated 5 out of 5 by julie500 from great game Loved this game,it had some different fun elaments.I am a fan of mcf but this is one of the better ones.I enjoyed the difference with the puzzles,sometimes you come across the same old, same old! So this game was a pleasant surprise.Please give us more of this. Rated 5 out of 5 by babyfishgames from Best game ever! The fourth installment in Ravenhearst... Love it! The story of this game is really good, Alister had a huge connection into the Ravenhearst story. We also could meet Charlotte and Gwendolyne- the 2 little twins (there are now adults). The music was amazing! There was also the original mcf soundtrack!!! The graphics were very good, I really liked them. There was also a chance to go back to the asylum in the bonus chapter. You all must play this game, because Eipix is doing a lot better than EG! Rated 5 out of 5 by FIZZYxPOP from Returning to the house that love built. It is a beautiful game that lives up to expectations, if you've played the other games and know the story then it lives up to the previous and is very well executed, as to be expected the art work is stunning and as foreboding as ever, the music and sound effects are thoroughly eerie. I always end up thinking that the games are not quite long enough, but that has nothing to do with the quality of the games themselves it is just that I never want them to end. I am honestly hoping that one day they do release a game that is centered around Ravenhearst when it was still inhabited by Charles Dalimar and Emma Ravenhearst while they are still alive and living, sort of a "Beginning of the madness" kind of thing. What can I say, I can't get enough. 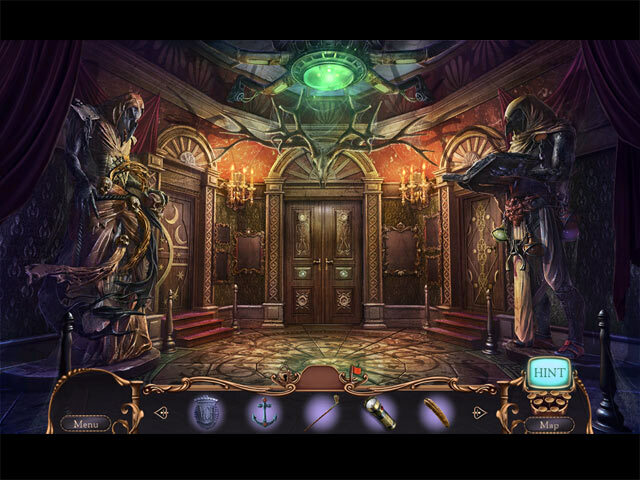 Rated 5 out of 5 by JCCFIORE777 from MYSTERY CASE FILES: KEY TO RAVENHEARST COLLECTORS EDITION LOVE LOVE LOVE THIS GAME!!!! IT HAS VERY INTENSE. CREEPY WHICH I LOVE! LOTS OF FUN. Rated 5 out of 5 by RoYaLOaKGiRl from One of MCF Best Games I've played all the MCF games and this has become one of my favorites! I love the graphics, storyline and the mini games most of all. Keep it up MCF! Looks like a teaser at the end of the bonus game for more at Ravenhearst! Rated 5 out of 5 by frog44 from What's not to like. Having the original 3 Ravenhearst games, I wanted to keep going with the 4th. Found it to be as great as the others. The multi-action puzzles where just difficult enough to be challenging requiring some thought and time but never requiring the use of the skip, hint, or guide. I hope it's possible to have a 5th and maybe, just maybe, bring some of the original characters back (as ghosts??). I really enjoyed the credits....very funny and worth the time to read!! Rated 5 out of 5 by BeccaBlue from Really a great game I play a lot of HOPs. This one was refreshing - just different enough to hold your interest. Loved the multi-puzzles. Good graphics, and a story that made sense although having played ravenhurst games before makes it even better. I enjoyed getting the collectibles after I I finished the game. Thanks guys - good first game after taking over the franchise. Rated 5 out of 5 by Firehorse66 from Love MCF games but not the best I love MCF games for their amazing puzzles and I loved all the puzzles they had but they were fairly easy and not as creative as their past games. But compared to other games it's still 5 stars. I love how creative and different MCF games are and they don't release often enough. This one was very different then the past games, were they bought out? Has Eipix alway made the MCF games? I miss the old ones that they didn't update so I they are not compatible with the new Macs. I hope they update them so we can play those again. They were so awesome! Rated 5 out of 5 by IPickYellow from Overlook the story and it's a great game This story line was a bit confusing, however the game play was far superior to many I've played lately. If I want an excellent story, I read a book. What I want here is a good game. The story just needs to be good enough to keep the search and quests going in some logical path. There was only one moment when I couldn't think how to solve a situation and had to use the "hint" button, and when the solution was revealed I thought "really, is that your solution? ", because it just seemed lame. But, that only occurred once. Most things seemed to follow some kind of logic, which so many games lack. And there was one puzzle I just couldn't understand (the one with the four computer screens and the whole + - x). The demos were supposed to be helpful, but they weren't (IMO). That being said, all the other puzzles took a bit of pondering, but I was finally able to figure them out. I like a good challenge. And I like that the MCF puzzles always have an old, over-used look to them. I don't know why, but it seems to add to the creepy atmosphere. The graphics, ambiance, music and sound effects were all fantastic. There was a nice, sinister feel throughout the game that didn't get stupid, overdone or fake. A mystery should feel like a mystery! Overall, I was very delighted with this latest MCF. Rated 5 out of 5 by Freckles999 from Woohoo Ravenhearst is back! Hi! Just wanted to drop a short note to say that I’m so happy to see Ravenhearst being brought back to life! Who could ever forget the Ravenhearst-series, I have always remembered them as my favourite games. In this new game there’s a lot of the MCF-blueprint that I love. I find it very creative, original, there’s a great atmosphere and it makes me laugh. I would rather have seen real actors, but these characters are awesome as well. I am hoping MCF will continue to be daring, it suits them so well! Rated 5 out of 5 by melsimmons from Fun HOS and puzzle game I've been a Big Fish member for years and this is the first review i wanted to write. Loved this game. It had great puzzles especially the "big" puzzles with many pieces to solve to finish. I had played the early Ravenhearst games a long time ago. This is better with a lot of the newer features such as custom setup and 'partial skip' of the big games. i don't usually like the collectors editions, but this one had a very fun Bonus chapter and the abilty to just play the games alone. Rated 5 out of 5 by Chrysalis_New from Best Ravenhurst Ever, Best Game 2015 Thank you Eipix for a great game. This is by far the best of 2015! I am a fan of the Ravenhurst series but I was totally taken with #4. Mysterious and creepy storyline, excellent graphics and the puzzles were just difficult enough. Now if I can keep in from ending!! Rated 5 out of 5 by mnh2099 from Great Game! Really enjoyed another Ravenhearst Game! Rated 5 out of 5 by Cherubabies from Best Game of Ravenhurst yet! Beautiful Graphics, excellent Spookiness, and the Story line was just GREAT! Puzzles were unique and different. I recommend you try this Game! Rated 5 out of 5 by LadyEM48 from Is This the Real End of Ravenhurst!? The Ravenhurst anthology, has always been in the top ten of games from the very beginning ... until now. The "Key to Ravenhurst" takes to us a whole new level, by which all subsequent games will be judged. After learning Ravenhurst has been rebuilt, you are sent to investigate, only to learn the evil inside has multiplied beyond anything you have ever faced. The usual HOPS, and progressive puzzles have changed very little, older puzzles have been reinvented, and new games added. . Not only do you have to deal with the house, whose only role in existence is to kill you, by any means necessary, but one, over the top zino-psychopath, who is killing everybody they can get their hands on, INCLUDING the construction crews, in order to harvest their souls, to bring back their ancestors in order to, you guessed it, take over the world! So what else is new!? From beginning to end, this game holds your attention and challenges every level of player. As to your detective? Oh no my friends, I don't want to destroy your expectations. Just go for it, but watch out for the man whose head has been replaced with a TV set. Rated 5 out of 5 by broke_down from Best of the series! This review is based on playing the full CE plus the bonus chapter. I'm not sure what game the unhappy reviewers are playing- it couldn't be this one; I enjoyed this release more than the earlier offerings in the series. Lots of mini games and puzzles with varying degrees of difficulty kept me playing late into the night. Graphics were great and the music was just right on the creepy scale. Keep them coming! Rated 5 out of 5 by charlene_lane from WELL DONE EIPIX - SUPERB GAME REVIEW FROM COMPLETED GAME, BONUS and EXTRAS There is: * Voiceovers (with dialogue); * Regular, Hard, Insane and Custom modes of play; * 14 Achievements; * Find 34 ravens (in game only); * Six super puzzles; * Lengthy Bonus game; * Lots of extras. The graphics are absolutely spot on - kind of dark, moody and with just the right amount of ambiance. There is plenty of colour where needed which was not too bright or garish. Sound is excellent. The music is orchestral and also has pieces of music from previous Ravenhearst games. 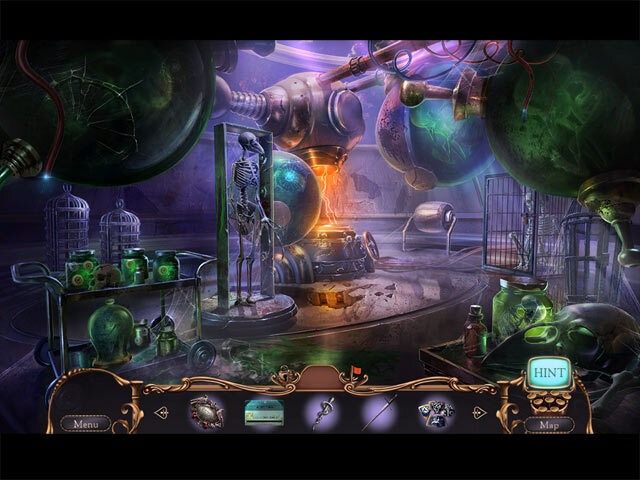 The hidden object games were interactive straightforward and silhouette. There were even little mini-games in them as well. There is one morphing object per HOS, so keep a beedy eye out for it. However, if you do miss one, don't worry cause you can replay all the HOS in the Extras. There were a huge variety of mini-games to play which had a good challenge. I played on Custom mode and turned off Skip and Hint, so I played them all without help. Some of these did take a while to do. Wine helped. There were also six super puzzles to do. These are my ultimate favourite to do. Now, they weren't too hard this time round. There is no timer and you don't have to do tasks in any particular order. Each one took me about 10-15 minutes to do. There are 34 ravens to find throughout the game (not the Bonus). Most of these were easy to spot, but a few were a few elusive. However, if you don't feel like finding them in the game, then you can do this in the Extras. It is possible to get most, if not all, of the Achievements. I failed miserably on completing a mini-game in under a minute (I just ain't that fast). There is plenty to do in the Extras. You have 32 objects to find in the Souvenir Room, you can find all the ravens (if you missed any or wanted to do them later), replay the HOS and mini-games to get extra achievements, etc. All up the game, bonus and extras took me about 10 hours to do and I enjoyed every minute. Honestly, I could have gone 10 hours more. Definitely comes recommended. Happy playing fishies. Rated 5 out of 5 by julie1345 from Eipix does it again I haven't finished the main game yet, but, WOW. I am thoroughly enjoying it. I usually go through a game within a few sessions, but not this time, it is jam packed. (spoiler) I love the way either a mini game or small HO turn into a larger HO. Make sure you don't miss this one. Rated 5 out of 5 by BFGMCFFAN from Good, Better, MYSTERY CASE FILES!!!!! My all time favorite series Mystery Case Files is back. After two years in the hands of Elephant Games, which in my opinion didn't do the best to the series Eipix is the developer this time. They are my favorite developers, but still I was very afraid if they can develop a great MCF game, but they CAN! Finally a real Mystery Case Files game! The Main game is 6 chapters long and I needed around 4,5 hours to complete the game. The story starts, like always, because of new developments in Blackpool the Master Detective is called to investigate the case. For the fourth time he returns to Ravenhearst, just to find himself in new horrors. This time the Ravenhearst Manor has been rebuilt by new owners, but are really new owners the ones behind dissappearing ships and people? No, not really. While your investigation you'll meet our beloved twins Gwendolyn and Charlotte in a "new" way and our arch enemy Alister makes fun of the MD through his Enigma Box filled with riddles and mini-games. I really loved the story involving new and old characters, starting mysterius and slowly unraveling. In the end there will be many surprises and really everyone who expected to see old characters there will be happy. Oh and be careful if you open the cabinets ;) And is this really the end of the Ravenhearst Story or... The graphics and the atmosphere are very close to the original. Sadly the MCF main theme is just inclouded in the soundtrack, not in the game. That would make it even better, but Eipix really looked how BFG-Studios created the Ravenhearst environment. Many well known places and some new ones are waiting to be discovered, filled with scaryness and evil. The creepy atmosphere is absolutly there! The sounds are good, and fit with the visual, I'm just missing the "missplace" item sound, which was a typical MCF sound when an inventory item was used in the wrong place, always appearing together with a snarky comment. So I hope to hear that sound again next year. There are plenty mini-games in Alisters Enigma, in HO's or during the gameplay. Some of them are easy others are very tricky and require the Master Detective skills. There are also some complex combination puzzles, like there used to be in MCF games. Sadly there's to much help for them. I prefered the case report, where things were written down, so we had to look them up ourselfes. Also there are super puzzles which are brilliant and I really loved them! Great work here. The CE comes with many extras, including art, video, soundtrack, wallpapers, HO's, puzzles, Souvenirs and more. Afterall the game is not as perfect as a Big Fish Studio MCF, butI'm critizising on a very high level here, and after EG's not soo good job in my opinion the Eipix team has outdone themselfes. It's there best game up to date and worthy MCF sequel and I sure hope that MCF remains in the hands of Eipix. Also Thank you Carlos for giving us clues during September and October! Really appreciated! Rated 5 out of 5 by atsfgal from Was Not Disappointed MCF is back on track with the newest release. We have every game from the series and this is one of the best. Rated 5 out of 5 by LunaNik from Eipix brings Ravenhearst back to life! Behold: the Key to Awesomeness! 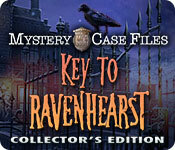 Mystery Case Files: Key to Ravenhearst CE Review based on completed game + bonus chapter + extras PROLOGUE... I love story series, whether they come in movie, game, or book form. It stems from my tendency to completely immerse myself into the fictional universe, and to always wish to know what happens to the characters after "The End." So it was with both excitement and trepidation that I downloaded Key to Ravenhearst, knowing it had not been developed by Big Fish. I'm happy to say that I was more than pleasantly surprised; I was blown away. ONCE UPON A TIME... As an experienced Master Detective, I have followed the tragic and twisted lives of the Dalimar family beginning with its patriarch Alister, evil carnival magician, and his wretched wife Abigail. I lived through their son Charles' abusive childhood at the hands of his mother, as well as his institutionalization. I learned how Charles wooed, then imprisoned Emma, and finally murdered her while building Ravenhearst Manor. I relived the horrifying captivity of Rose Somerset and her twin daughters Gwendolyn and Charlotte, and met Charles' damaged son Victor. And I solved the murders at the carnival, uncovered the mystery of the disappearances of Blackpool's residents, and helped Madame Fate finally move on to her eternal rest. And just when I thought the story had reached its end, the Queen—Yes, really!—called upon me once again, this time to investigate rumors of Ravenhearst's resurrection. Upon my arrival, I see that the rumors are true, for construction appears to have rebuilt Ravenhearst from the ashes! An arrogant young woman refuses me entry, saying that the Ravenhearst Museum is not yet open. Museum? What horror is this? And who is the oblivious man who obeys this woman's every command? Is it possible that the Dalimar family is involved in this?! I need to get inside that Manor! PLAY THE GAME... If you read my reviews, you know that I consider Charles Dalimar the ultimate puzzler...and his fiendish locks are back! These are not merely several simplistic mini-games combined on one screen, but the truly interactive, Rube Goldberg-esque mindbenders that characterized Ravenhearst. In fact, puzzles abound in this game; they're everywhere from inside the HO scenes to the enigma box to stand-alone. Quite a few are inspired by previous Ravenhearst games. HO scenes are either interactive list or sequential silhouette, but all of them include puzzles, mini-games, zoom box mini-HOs, and more. And while some of the objects are in plain view, many are hidden by various devices including being partially behind another item, not looking the way you expect (e.g. one "skull" was in blue embroidery), etc. And each HO scene has a morphing object. Adventuring includes lots of clue-finding, a bit of reading various people's diary pages, finding missing things, fixing broken items, talking to NPCs, answering trivia questions, and a lot fewer of those shaped medallion locks. :-) SIGHTSEEING... Eipix has painstakingly recreated the buildings and grounds of Ravenhearst Manor with a slightly different viewpoint. You will absolutely recognize the environments in this game as unmistakably Ravenhearst, but you won't be bored either, as there are new rooms and areas to explore too. Elements are present from all the previous games, making the transition to a new dev seamless. The color palette is beautifully moody and keeps you on edge the way a really good haunted house does. Light and shadow are used perfectly to bring dimension to the environment. Animation is smooth and lip synching is spot on. I do miss the live actors, but otherwise the visuals are awesome. There are some reminders of previous games, like the clacking typewriter in the HO scenes that types whenever you find an object. SOUNDBOARD... The classic MCF theme is slipped in here and there in several variations, which I love. However, the music isn't homogenous. There are dramatic orchestral moments and haunted piano pieces, and it always provides a perfect backdrop to the game. Environmental sounds are exacting, from creaking doors to ocean waves crashing on the beach, from the ebb and flow of the rain to rolling thunder and the sharp crack of lightning. Voiceovers are professional. TOOLBOX... The inventory panel locks open, and plus items are indicated. The jump map indicates your location, objective, and available actions. The enigma box provides you with inventory items once you solve its puzzles. An icon indicates whether you've collected the raven in the scene (and another shows when the morphing object in the HO is morphing). OH BOTHER! I encountered no technical difficulties, lags, mistranslations, or issues of any kind. OOH! PIECE OF CANDY... The bonus chapter relates the history of the "oblivious man" I mentioned above, and his involvement with Ravenhearst. There are 34 collectible ravens (and you can go back and get the ones you missed). You can replay all the puzzles and HO scenes (including getting the morphing objects you missed). There's also a souvenir room in which you can revisit the scenes in the game to find an additional object in each. You can download 11 musical compositions, view game artwork, and utilize the SG. EPILOGUE... I feel like Eipix read my reviews, silly as that might sound. This is everything I was looking for in a HOPA and more. Engaging storyline, captivating gameplay, immersive graphics and music, fully loaded CE. For the first time in a long time, I can say that I highly recommend this game. Of course, now I must go back to the beginning and replay the entire series. Happy gaming! Rated 5 out of 5 by zeldaqn from ANOTHER MCF WINNER IM NOT SURPRISED First of all I LOVE having custom options because I hate black bar tips that lead you by the nose. I don't understand the bad reviews I see here. The puzzles are original and the hos (not usually my thing) were full of variety and challenge. I recommend this game to all who like a challenge. This review is based on 3 hours game play. The only upgrade I can see on this and other games in the bf community is to make it easier to get to the rate screen and you will probably have more. Rated 5 out of 5 by pflugglz from MCF: Key to Ravenhearst This has been a long awaited game in the series and I must say, the wait was worth it. Eipix did an amazing job of staying with the Bigfish established tone, graphic excellence, and story line of the preceding games in the series. The puzzles were just challenging enough to make you think but not so difficult that you needed a hint. This is a game that you don't want to finish, you just want to keep playing and playing.